I am looking into getting an Australian Shepherd; but need to know whether they make good emotional support dogs. A family member suffers with depression and anxiety; but they love to exercise, so need a fairly active dog. 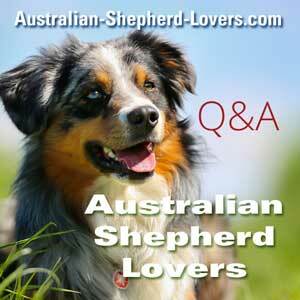 My research so far has shown the Australian Shepherd to be a good fit. But I want to be sure they are good emotional support animals. You wont go wrong with an Aussie! I was suffering terribly with bouts of severe depression and since getting my Aussie 6 years ago have not needed medication or anything. I've still had down days but these are now very few & far between and short lived and nowhere near as debilitating. Besides their love of exercise, Aussie 's are playful, unbelievably humorous & goofy - they will bring a smile to your face even on the worst days. They are also sensitive and love nothing more than curling up with their human when they arent up to facing the world. If you can handle everything else that comes along with being an Aussie owner then you wont have any regrets at all. I've had depression and anxiety ever since puberty. I lived alone for almost 20 years. Four years before I met my husband, I adopted an Aussie from the pound. He was already two years old. I had met a psych dog, an Aussie, that was there on the unit to be pet and played with by patients. These dogs never get sick of attention and form strong bonds with people. I wish that I had gotten a dog sooner! There were days when he was the only soul that spoke to. You can't sleep all day when someone wants to play and needs to go outside. He got me outside and active.This beautiful, crazy dog lead me out of my deepest funks and I took him everywhere. Now, 8 years later, we are a happy and bigger family. First let me say that Aussies are a wonderfully compassionate breed. I grew up with an Aussie and I've had one myself for 5 years. In the past 5 years I've had some medical issues and Ellie has been right by my side. At one point she didn't leave my side for 9 hours, didn't even ask to go outside. We've experienced deaths in our family and Ellie senses the change in my demeanor and becomes very snuggly. I call her my best nurse :) That said, in my experience, that my anxiety tends to grow and feed anxiety in Ellie. I know that's typical for most breeds, not sure what level is normal though. As far as a dog to exercise with, you couldn't have chosen better. Ellie loves anything from walks to Frisbee. Ellie's favorite toy is her ball :) Ellie is my Joy and I'm sure you'd find an Aussie yours as well. I commend you for doing your homework on breeds considering your specific needs. A dog is going to be very lucky to call you family! As far as I'm concerned they are. Our aussie seems to know when something is wrong and pays more attention to my husband that has PTSD and gets him back to semi "normal". The dog does more for him than I can most times. You could do no wrong in getting an Aussie for this person, they are very smart and adapt in any situation, they can sense depression and they will give much love, they will steal your heart. I have 3 Aussies. They are by far the most loving, active, and loyal dogs I have ever had. They constantly are by my side giving me such love and devotion that I couldn't imagine possible. We are a pack, a family and on days when I really don't want to take our big pack walk, they make sure I get them out there. I would recommend them to everyone. that should be their middle name. omg emotional support is their middle name. if my boy Cooper even thinks that I'm sad or upset because of a sigh I let out, or my voice, he will sit beside me, look at me, nudge me. trust me, they are the best dog, especially for that. they will follow you around, even to the bathroom. they will listen and look to you for signs, and they will be there for you. Im an emt and at one of the ambulance services i worked for would allow employees to bring there well behaved dogs to work. One of our dispatchers had an Australian shepherd and she was a sweet heart. This dog was amazing and had what seemed to be a sixth sense with human emotions. She would pick up on it when we were having a difficult day or had just had a bad call and would greet us with her tail wagging or put her head in our laps. She had been found as a stray by her owner and only had 3 legs. Our dispatcher had not trained her to be a therapy dog but she served that capacity unofficially.